Date: Wednesday, 23rd October 1974. Venue: Szusza Ferenc Stadium, Budapest, Hungary. Competition: European Cup Second Round First Leg. 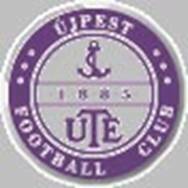 Scorers: Ujpest Dozsa: Fazekas (pen). 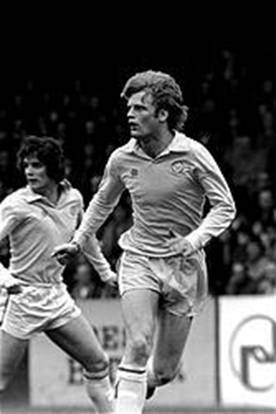 Leeds United: Lorimer, McQueen. 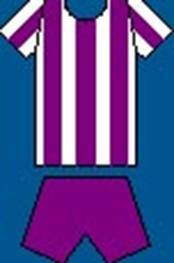 Ujpest Dozsa: Rothermel; Kellner, Harsanyi; Horvath, Nagy, E. Dunai; Toth, Fazekas, Fekete, Bene, Zambo (A. Dunai). Leeds United: Harvey; Reaney, Cooper; Yorath, McQueen, Hunter; Lorimer, McKenzie, Jordan, Giles, Madeley. Referee: Kurt Tschenscher (West Germany). Jimmy Armfield’s first foray into Europe as Manager was a daunting trip to Hungarian League leaders Ujpest Dozsa, and he marked it with a famous victory. United had been paired with their old Hungarian rivals, whom they had met twice before in the old Inter-Cities Fais competition. They had won the first tie but lost the second, as they were beaten at both home and away. Armfield knew his men faced a big challenge in Budapest against a side that had won the Hungarian League title for six consecutive years and had only dropped two points from ten games in the current campaign. The new Manager’s inexperience seemed irrelevant as United took the lead after only seven minutes with a Peter Lorimer thunderbolt. 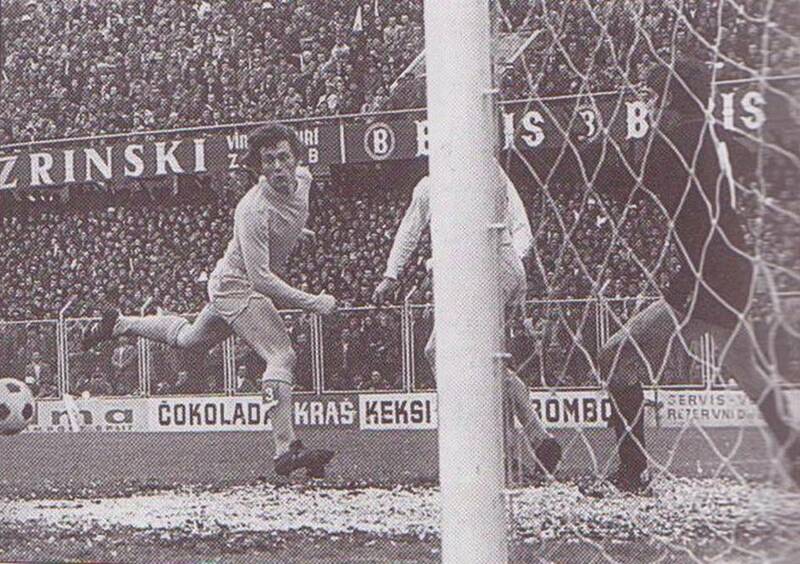 Terry Cooper, in a familiar advanced position on the left, crossed towards goal, forcing the Ujpest goalkeeper Adam Rothermel to palm the ball out, Duncan McKenzie collected the loose ball and played it to Peter Lorimer who lashed it into the net. The irrepressible McKenzie, who had been bought by Brian Clough for £250,000 from Nottingham Forest, was, like his Manager Jimmy Armfield, making his European debut. He was in the team for Allan Clarke, who was suffering from a bruised instep, and early on it looked as though McKenzie would be joining Clarke on the treatment table. The striker was being battered from one side of the pitch to the other by the Hungarian defence and when he was hacked down from behind by Josef Horvath in the fifteenth minute, McKenzie snapped. He retaliated and was ordered off by the West German referee, who had given McKenzie little protection early on. Tschenscher did little to endear himself to the Leeds players five minutes later when Laszlo Fekete went steaming into the Leeds area and Terry Cooper clearly pulled out of a tackle. Fekete tumbled despite that and the referee gave a penalty which Laszlo Fazekas converted, despite a valiant by David Harvey to save the kick. Fortunately, despite their adversity, United quickly regained the lead three minutes later when Gordon McQueen headed home. United had stuck to their attacking game-plan and in the twenty-second minute the big Scot got his first European goal when he headed in a Johnny Giles free-kick. The big centre-half also went close with another header while Johnny Giles saw a thirty-yard shot scrambled off the Ujpest line as United continued to attack whenever possible. Despite having Duncan McKenzie sent off, United controlled the match and were unlucky not to increase their lead. Even down to ten men, however, United still proved too good for the Hungarians and United were able to take a lead into the second leg at Elland Road. It was not all one-way traffic, however, and David Harvey had to produce three excellent saves to deny Laszlo Fekete, Laszlo Fazekas and Ferenc Bene but there was still time for a sting in the tail of a remarkable match. 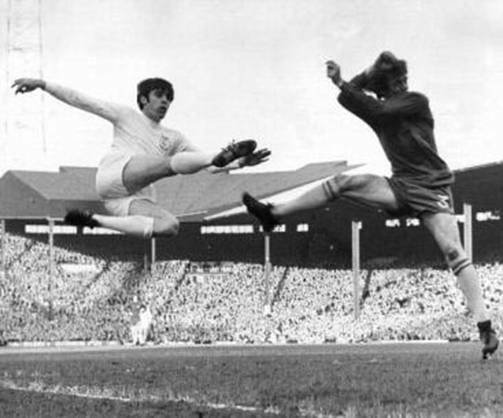 With nine minutes to go, Joe Jordan was brought down in the area but Peter Lorimer could only hit a post with his spot kick and seconds later it became a ten-a-side game as Laszlo Harsanyi brought down Terry Yorath and was ordered off for a second bookable offence as United took a one goal lead back to Elland Road for the Second Leg.